Valentine’s Day and candy are a match made in heaven. Learn more about the holiday’s long association with sweets and the trends, history, and trivia surrounding Valentine’s Day and candy. More than 36 million heart-shaped boxes of chocolate will be sold for Valentine's Day. American men say they’d prefer to receive boxed chocolate as a Valentine’s Day present followed by gourmet, high-end chocolates, then conversation heart candies. A majority of men (53 percent) admit that they lean on friends and family to find the perfect present for their sweetheart, while 11 percent look to co-workers, 10 percent ask the cashier and 7 percent consult the internet. Even if they don’t make the final purchases until the last few days, the majority of men (75%) testify that they plan ahead for Valentine’s Day. When it comes to present time, women prefer a gift after a nice dinner, while most men prefer gifts first thing in the morning. American men and women agree that the most romantic place to share candy is in front of the fireplace. On average, men shell out $130 each on candy, cards, jewelry, flowers, and dates. That’s more than double what women commit to spending. Children receive 39 percent of all Valentine’s Day candy and gifts. Following them are wives/mothers (36 percent), fathers/husbands (6 percent), grandparents (3 percent), and pets (1 percent). In the 1800’s, physicians commonly advised their lovelorn patients to eat chocolate to calm their pining. 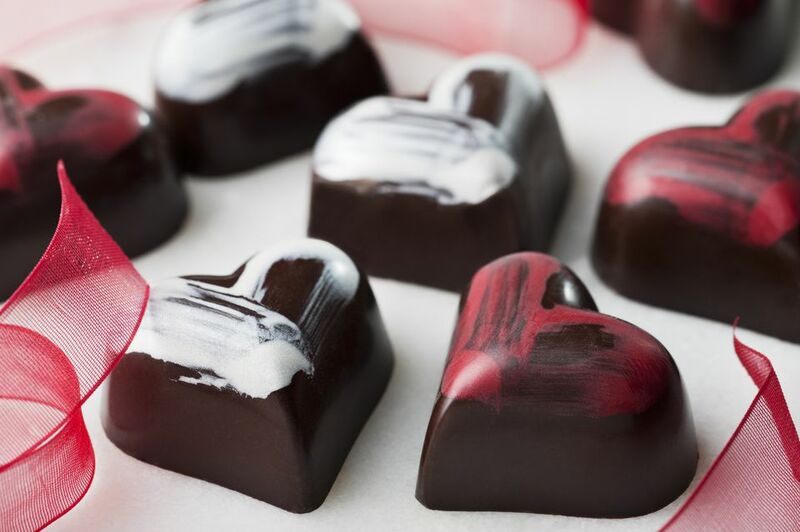 As an elixir for love, chocolate has been believed throughout history to bring smiles to the broken-hearted and to prompt amorous feelings in both men and women. It is believed that Madame Du Barry served it to all her suitors; Casanova consumed chocolate instead of champagne to induce romance; and Montezuma, the king of the ancient Aztecs, believed chocolate would make him virile. At one time, conversation candies were made into shapes including horseshoes, baseballs, and watches. About 8 billion hearts will be produced this year; that’s enough candy to stretch from Rome, Italy to Valentine, Arizona 20 times and back again. The peak selling season for conversation hearts last only six weeks, but confectioners produce the candy for nearly eleven months of the year. At least 10 new conversation heart sayings are introduced each year. Recent additions include "Yeah Right," "Call Home" and "Puppy Love." Each year the television game show JEOPARDY! includes questions about conversation hearts on its Valentine's Day show. Trivia facts and survey results provided by the National Confectioners Association and used with permission. Heart-Shaped Thin Mints, The Perfect "I Love You"